When looking for the best mid size sedan you’ll want to comparison shop as it can help you see which brands offer the most. If you are looking for a top of the line ride, you may come across the best luxury sedans like the BMW 2013 3 Series or the Mercedes C350. If you want a sedan that boasts a luxury driving experience, but isn’t as expensive then you should look at the Hyundai Genesis sedan. The Hyundai Genesis sedan comes with many of the features you would find on a luxury brand like the option to choose either a V6 or V8 engine. The V6 engine comes in either 3.8 liter or 4.6 liter, which boasts 333-hp or 385hp respectively. The V8 engine cranks out a powerful 429-hp. Additionally, customers will love the exterior styling as it compares to many of its luxury counterparts and offers outstanding options like adaptive headlights, which will swivel with turns. The car also come standard with fog lights and heated side mirrors. Along with the exterior, customers will enjoy the many features the interior has. For the tech-friendly driver, you will love the Bluetooth cell phone connectivity. Passengers and drivers alike will enjoy the XM Satellite Radio. Lastly, Hyundai put little touches into this model that make it more comfortable like heated front seats, leather upholstery and optional heated rear seats. 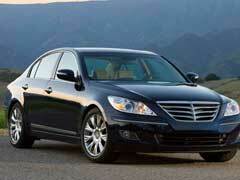 The last and most important draw to the Hyundai Genesis sedan is its safety features. Each car comes with side curtain air bags, an electronic stability system and optional equipment like front and rear parking sensors, which can help you when navigating in tight spots. Best of all, the antilock brakes come with electronic brake-force distribution that will help drivers maintain a better handling on the ride. When looking for drawbacks, there were a few. Cars.com states they didn’t like the fact that the backseat didn’t fold or there wasn’t an AWD option available. With that said, these are more preferences than performance issues so unless you have to have either, the Hyundai Genesis sedan will be an outstanding choice for your next set of wheels. If you are looking to buy one you can stop by your local dealership. When you test drive it you’ll be surprise just how fun and innovative this car is. Best of all, with models beginning at $34,200, you can enjoy a luxury car without the gigantic sticker price.